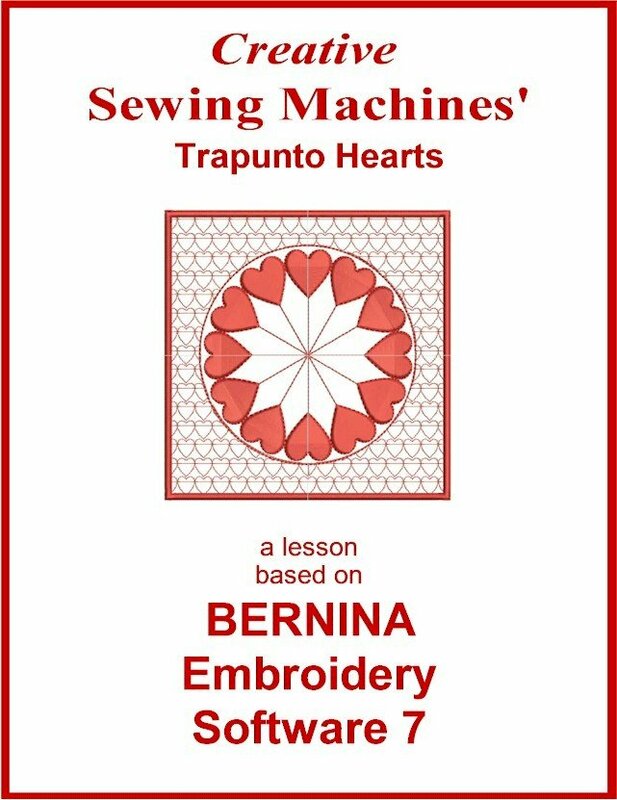 One of the most fascinating features of the BERNINA Designer Software 7 is the ability to create the beautiful look of trapunto with designs digitized in your Software. Satin Stitched Threads replace the traditional batting or stuffing usually used in trapunto. It’s amazing to watch the machine slowly sew each and every satin stitch to form beautiful raising stitching. The design then sews straight stitching around each raised satin shape after you lay a piece of fabric on top. The Trapunto 34 page Mini Lesson will show you step by step how to digitize and then stitch out the designs. There are screen captures of each step of the digitizing followed by the sew-out steps of the design with full color pictures. This lesson is very detailed and other things covered in the lesson include: Drawing shapes in Art Canvas, coloring and converting drawings to stitches, changing stitch angles, digitizing, mirror merge tools, removing jump stitches, pattern fills, cutting holes, and on and on. Even if you aren’t really comfortable with the software tools you will be able to follow the lesson because each tool, icon, and design element is explained.